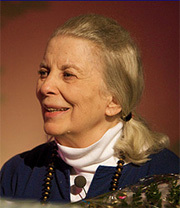 A founding member of Ananda Ashram, Joan Suval is a senior disciple of Shri Brahmananda Sarasvati, who called her “Mother of the Ashram.” Since 1964, authorized by Shri Brahmananda, Joan has offered meditation and Yoga-Vedanta programs for the Yoga Society of New York, both at Ananda Ashram and in NYC. Shri Brahmananda also directed Joan Suval in the recording of his “Blue Sky Meditations.” Over the years, she has accepted invitations to present her program, “Readings from the Masters,” in San Diego, Los Angeles, Nashville, Ireland and Switzerland. Joan was also on the staff of the Post Graduate Center for Mental Health in NYC, where she developed the Center's first meditation and stress reduction program. Visit her website for more information. April 13, May 11 (Silent Retreat), June 15, July 20 and August 24. A profound and empowering program examining Eastern teachings as they relate to our everyday lives. The program begins with the traditional Vedic fire ceremony and meditation period. This is followed by Joan Suval's unique combination of selected readings exploring the inspired message of Shri Brahmananda Sarasvati and other great masters, presented through engaging and insightful dialogues. Joan conveys the Vedantic teachings in a clear, serene and supportive manner, emphasizing the importance of "witnessing" and application of these teachings in our day-to-day experiences. In a relaxed and informal setting, Joan welcomes all questions from students and guests and shares many provocative and often humorous anecdotal memories of times with her Guru, Shri Brahmananda Sarasvati. Joan transmits the message of her teacher and other great masters, encouraging participants to ask questions "from the heart." In return, they receive insight and advice regarding the practical application of these ancient teachings. The evening may conclude with devotional music or chanting. All those new to meditation and the Witnessing Process, as well as those who are experienced in these, are invited to a period of "Guided Witnessing Process" in the Temple upstairs in the Main House. The session uses the recording by Joan Suval, "Witnessing from Second to Second." 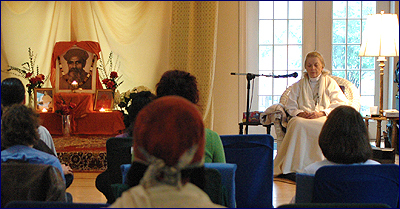 Also inquire about the yearly Silent Retreats held at Ananda Ashram with Joan Suval and Ashram teachers. Joan Suval also conducts evening programs in New York City at 7:30pm on the 1st Wednesday of every month (except February and March, 2019). The sessions include readings from the works of Shri Brahmananda Sarasvati and other great masters. In a peaceful and meditative setting, Vedantic teachings are explored and explained, emphasizing the importance of effortless witnessing and the need for daily application. 247 West 36th Street, 6th Floor.